429 Marlborough is located on the north side of Marlborough, between Massachusetts Avenue and Charlesgate East, with 427 Marlborough to the east and 431 Marlborough to the west. 429 Marlborough was designed by architect Obed F. Smith and built in 1886-1887 by Charles A. Dodge, mason and builder, one of three contiguous houses (425-427-429 Marlborough) built for building contractor George Wheatland, Jr., for speculative sale. He is shown as the owner on the original building permit applications for all three houses, all dated October 14, 1886. As originally built, all three were three stories in height, probably all of the design which survives at 429 Marlborough. By the mid-1890s, and possibly even before they were occupied, additional stories had been added to 425 and 427 Marlborough. All three houses show as 3 story houses on the original permit application and on the 1887 Sanborn map, but 425 and 427 Marlborough show as having four stories on the 1897 Sanborn map and 1898 Bromley map. 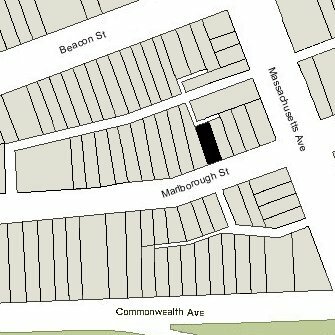 Click here for an index to the deeds for 429 Marlborough, and click here for further information on the land west of Massachusetts Avenue between the south side of Beacon and the north side of Commonwealth. On March 3, 1888, 429 Marlborough was purchased from George Wheatland, Jr., by John W. Wheelwright and George Lewis, Jr., trustees under the will of George Lewis, Sr., as the home of George Lewis, Sr.’s daughter, Elizabeth Sumner (Lewis) Nourse, the wife of Thorndike Nourse, and their daughter, Annie Endicott Nourse. The Nourses previously had lived in Detroit, where Thorndike Nourse was a book binder, printer, and publisher. It appears that Thorndike and Elizabeth Nourse opted to live apart, she in Boston and he in Europe, where she visited frequently. He died in Quimper, France, in July of 1904. 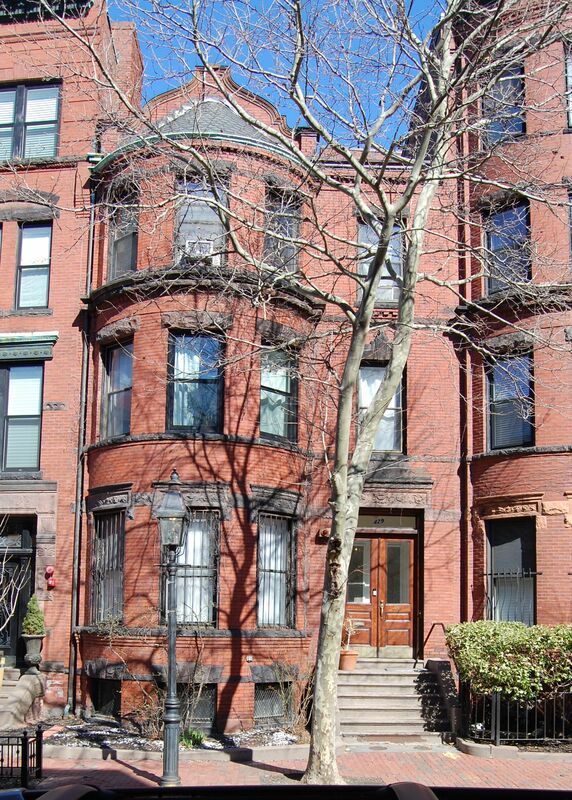 During the 1891-1892 and 1892-1893 winter seasons, while Elizabeth and Annie Nourse were in Europe, 429 Marlborough was the home of real estate investor Russell Sturgis Codman and his wife Anna K. (Crafts) Codman. They had married in August of 1891 and 429 Marlborough probably was their first home together. They had moved by the 1893-1894 season, and by the 1894-1895 season were living at 14 Gloucester. During the 1899-1900 winter season, when Elizabeth and Annie Nourse were again traveling in Europe, 429 Marlborough was the home of William Branford Shubrick Clymer and his wife, Katherine McCall (Livingston) Clymer. An architect by training, he had been an instructor in English at Harvard and then became a writer on literary subjects. By the 1900-1901 winter season they were living at 30 Chestnut. And during the 1904-1905 winter season, when Elizabeth and Annie Nourse probably were once again in Europe (following Thorndike Nourse’s death in July of 1904), 429 Marlborough was the home of retired railroad and iron mining developer Joseph Lincoln Colby and his wife, Mary C. (Little) Colby. Their usual home was in Newton Centre. Elizabeth Nourse died in January of 1916. Annie Endicott Nourse continued to live at 429 Marlborough until about 1942, when she moved to an apartment at 282 Beacon. On September 27, 1941, 429 Marlborough was purchased from the trust established under George Lewis’s will by Eleanor D. (Peterson) Landesman, the wife of Dr. Henry Mayor Landesman. They previously had lived in an apartment at 366 Commonwealth, and prior to that at 424 Marlborough. Henry Landesman was a physician and also maintained his office at 429 Marlborough. He died in May of 1946. After his death, Eleanor Landesman continued to live at 429 Marlborough. In July of 1947, she applied for (and subsequently received) permission to convert the property from a single-family dwelling into a single-family dwelling and lodging house. On August 12, 1948, Eleanor Landesman transferred 429 Marlborough to Arthur Michael Gold. They married that month. After their marriage, they lived in Marblehead. On August 19, 1948, 429 Marlborough was purchased from Arthur Gold by Ruth (Gaston) Howard Foster, the wife of Lawrence Foster. They also maintained a home in Manchester which appears to have been their primary residence during World War II, in which Lawrence Foster served as a Lt. Colonel in the US Army. Until about 1943, they had lived at 177 Marlborough. Lawrence Foster was an attorney and, from 1948 until about 1964, served in the Boston office of the Central Intelligence Agency. In September of 1948, Ruth Foster filed for (and subsequently received) permission to convert 429 Marlborough back into a single-family dwelling. Lawrence Foster died in July of 1968. 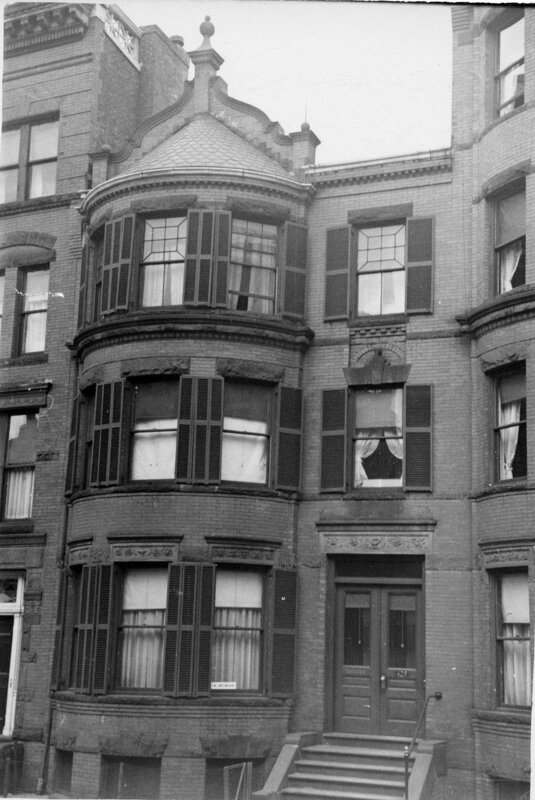 Ruth Foster continued to live at 429 Marlborough until her death in August of 1974. On April 20, 1976, 429 Marlborough was purchased from Ruth Foster’s estate by Eugene L. Metz, a widower. A former educator, he and his wife, Gloria (Eastman) Metz, had lived at 31 Fairfield in the early 1950s when he was an English teacher at Thayer Academy. In 1952, they moved to Europe where he was a director of the Free Europe Committee, which distributed books promoting democracy to European and African Students. In 1966, they had moved to Quito, Ecuador (where they had met after World War II) to restore the Hacienda Cusin (which later became a luxury hotel). After his wife’s death, he became director of the Collegio Americano de Quito until the mid-1970s, when he moved to Boston. By 1979, he had moved to Palm Beach, Florida, and on May 9, 1979, he transferred 429 Marlborough to himself as trustee of the Eugene L Metz 1979 Trust. On December 23, 1986, 429 Marlborough was purchased from Eugene Metz by Fred Koetter and his wife, Susie S. Kim, both architects. In December of 1988, Fred Koetter applied for (and subsequently received) permission to convert the property from a single-family dwelling into a three-family dwelling. On March 3, 1989, 429 Marlborough was purchased from Fred Koetter and Susie Kim by Joel Hudson Frank and his wife, Helen Hudson Frank. The property remained a three-family dwelling in 2018.